With Easter comes the Hot Cross Bun. The Hot Cross Bun is a spiced sweet bun traditionally made with raisins or currents that is eaten on Good Friday in South Africa and in a number of other countries. 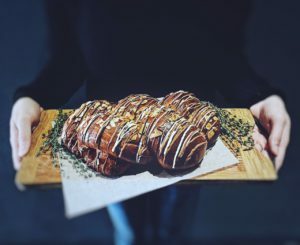 Although the traditional Hot Cross Bun is nothing less than yummy, we decided to try a recipe that is a little less traditional and a lot more delicious – a pretty plaited, almond sprinkled, chocolate drizzled, loaf of Hot Cross Bun inspired goodness. 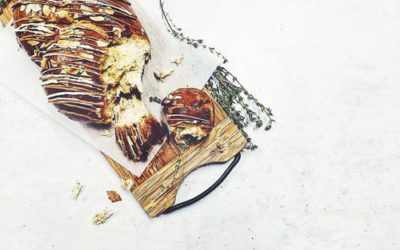 Celebrate the Easter holiday with this yummy pretty plaited ‘tear & share’ Easter bread. Warm milk and butter in a pan. Mix the dry ingredients and place in mixer with a hook attachment. Add milk mixture and eggs to the dry ingredients. Knead dough by hand – if your arms feel like they are about to drop off, call in some reinforcements. Cover with a cloth and let the dough proof for 2 hours, or until it doubles in size. Once proofed, wrap the dough in cling film and set in the fridge overnight. Remove cling film, and divide the dough into 3 equal parts. Proof the pieces for 1 hour. Roll dough pieces into 3 long sausage shapes and braid. Proof the braided dough in a warm area. Brush the braided dough in egg wash.
Bake at 160 C for 30 – 40 minutes until golden brown. Melt white, milk and dark chocolate and drizzle them individually over the bread. Maybe you feel like trying something a little sweeter? Why not create this masterpiece. Watch the video that Source Food developed for Pick n Pay and follow the simple steps to create the delicious surprise filled Easter egg cake. Click here for more information on our video production.